Sir Alex Ferguson is poised to come north in a bid to land another piece of top sporting silverware, with the horse he part owns, Harry The Viking, a likely runner in the Coral Scottish Grand National. The Paul Nicholls trained seven year old was named among the entries for the £180,000 race at Ayr Racecourse on Saturday 21 April. 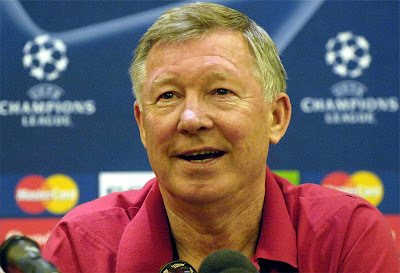 And with Manchester United not in action until the following day against Everton, Fergie (pictured above) may well be at Ayr to cheer on his horse. But there will be stiff competition with some of the country’s top chasers featuring in the 62 entries. Nicky Henderson has five possible runners, including Cheltenham Gold Cup fourth Burton Port. David Pipe has entered one of the Grand National favourites Junior and also The Package, owned by David Johnson. Cheltenham’s JLT Speciality Chase winner Alfie Sherrin from Jonjo O’Neill’s yard and Hennessey Gold Cup winner Carruthers are entered, as is the 2010 winner of the race and last year’s runner-up Merigo (pictured below leading the race in 2010). Notable Scottish trained entries other than Merigo include Lucinda Russell pair Red Harbour and Etxalar, Willie Amos’s Lie Forrit, Abbeybraney from George Bewley’s yard and the James Ewart-trained Captain Americo. The chief supporting race on Coral Scottish Grand National Saturday, the Isle of Skye Blended Whisky Scottish Champion Hurdle, has attracted 34 entries including Tetlami, Petit Robin and Kid Cassidy, all trained by Nicky Henderson, Donald McCain’s Desert Cry and Red Merlin, Raya Star from Alan King’s stable, and the Paul Nicholls trained Prospect Wells and Brampour.